Kerry admits there won't be a peace deal by April's deadline, but says, "I don't think anybody would worry if there's another nine months." U.S. Secretary of State John Kerry admitted on Wednesday that he would not be successful in securing a full peace deal between Israel and the Palestinian Authority (PA) by an April deadline, AFP reported. 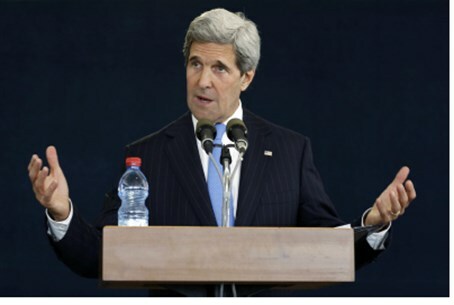 Kerry told reporters in Washington he was first hoping to agree a framework to guide the talks. "Then we get into the final negotiations. I don't think anybody would worry if there's another nine months, or whatever it's going to be... But that's not defined yet," he said in his private conference room at the State Department. "We're using the current deadline to help shape this," he added, noting he was prepared to continue the talks "for whatever period of time might be appropriate." Kerry coaxed the two sides back to the negotiating table in late July, after a three-year hiatus, and at the time said the aim was to reach a full peace treaty within nine months. But asked Wednesday if that was still possible, Kerry replied, "Well, no, we've been very upfront about that. For months we've been saying we're trying to get a framework." "We've understood what we can get within this time period. We've never fudged that," he insisted, according to AFP. "We're trying to get the framework, which is a huge deal if we've used these seven months thus far to get an understanding of where the parties are and to be able to shape the final negotiations," said Kerry. The negotiations have shown little sign of progress, amid bitter recriminations with each side blaming the other for the stalemate. Kerry insisted, however, that both parties were still "in the middle" of the talks. "I laugh at people who say it's not going anywhere. They don't know because we're not talking about where it's at. They have no clue where our negotiations are and whether they could go anywhere," he claimed. Last week, Kerry met twice in Paris with PA Chairman Mahmoud Abbas, in what a U.S. official later described as "constructive" talks. A PA official, however, said last Friday that ideas proposed by Kerry in Paris could not be accepted "as the basis for a framework accord... as they do not take into account the legitimate rights of the Palestinian people." Meanwhile, a report in the PA-based Al-Quds newspaper on Wednesday said that Abbas became very angry during his meeting with Kerry last week and threatened to end the negotiations with Israel. According to the report, Abbas fumed when, during a meeting with Kerry in Paris, the top U.S. diplomat presented a new offer which, according to senior PA officials, adopted the Israeli positions for a peace agreement. The newspaper also reported that in order to appease Abbas and get him to continue the negotiations, the Americans invited him to a meeting at the White House with President Barack Obama. Few details have been made public of Kerry’s proposed framework, though Thomas Friedman of the New York Times published some alleged details of the plan, which, he said, will call for a phased Israeli withdrawal from Judea and Samaria based on the 1949 lines, with "unprecedented" security arrangements in the strategic Jordan Valley. The Israeli withdrawal will not include certain settlement blocs, but Israel will compensate the Arab side for this with Israeli territory.